I’m a big fan of the Grateful Dead. With the announcement of the Grateful Dead celebrating their 50 years together with three final shows and Phish guitarist Trey Anastasio playing with them, I got extremely excited…and then bewildered as to why I had to use the USPS to do mail order for the three shows in July 2015. I live and breathe digital. I haven’t sent mail in ages and I couldn’t believe the Grateful Dead was making all of us resort to an antiquated system to get the first round of tickets. When I was 20 and doing mail order for Phish…yah…that was cool and fun and there was always the excitement of wondering if you got the tickets you requested…you would find out a few weeks later when they either returned your SASE envelope with tickets or your money order returned. (I always got Phish mail order, by the way.) But, I was 20 and not as busy. But, after seeing the creativity from Dead Heads the past few days, I realized the brilliance. By drawing together social media ideas to market the concert and having people use their creativity to possibly get free tickets or have their mail order requests noticed, the Grateful Dead started a viral campaign. They engaged their fan base (read customers) and got them even more excited about an event 7 months away! Oh…and they are going to make tons of cash on ticket sales even before tickets go on sale to the general public via the regular ticket agencies. You see, thousands of fans are coloring their mail order envelopes. Beautiful envelope artwork that engages fans and non-fans! Beautifully done artwork from a Dead Fan! This guy…not so artsy…but it’s the effort, right? It’s a thing. I used to do it for Phish. 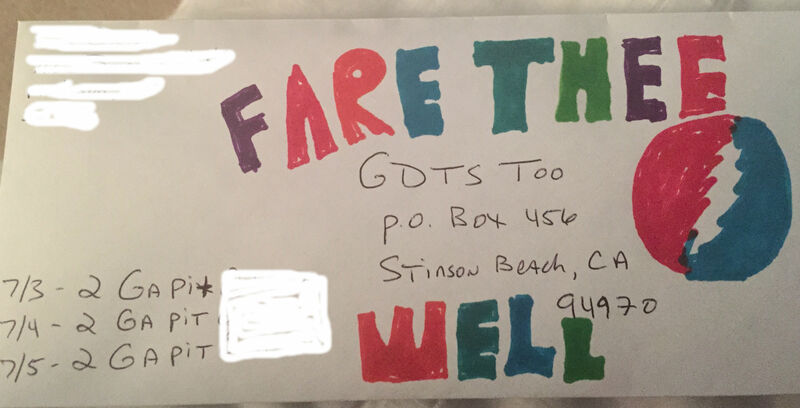 By getting all artsy and making creations on the outside envelopes, the Grateful Dead have folks talking about it with their friends and others (Word of Mouth), posting their pics of envelopes on social platforms (Social Marketing Strategy) and getting newbies to click to their digital platforms to learn more. It’s a simple case of using old marketing techniques to push new, digital marketing for a brand. It’s engaging your customers perfectly; it’s knowing what they want, giving it to them and letting them spread the word even more. Are there ways you can engage your customers by letting them be creative for your product? I bet there are plenty of ways…it’s what social media and digital marketing thrive on: Creativity.